The conflicting views of the nature of the war have contributed to disagreements about the way the United States used air power. But a much older argument has also played a role: that between the advocates of strategic and tactical bombing. Tactical bombing is directed against the enemy armed forces on the battlefield, or against forces and facilities close enough to the battlefield to provide direct and immediate support for the enemy forces on the battlefield. Strategic bombing attacks targets relevant to the overall power of the enemy nation, such as oil refineries, weapons factories, or the homes of the workers who make the weapons, rather than attacking individual military units or the facilities that support individual units. The U.S. Air Force was dominated by men who believed that strategic bombing was the best use of air power. Those who believed in strategic bombing, and those who believed that the real enemy the United States was fighting in Vietnam was the government of North Vietnam, tended to believe that the most significant use of U.S. air power would be attacks on the heart of North Vietnam. They were sorely disappointed. President Lyndon Johnson (1963–1969) was concerned that bombing in the northern half of North Vietnam, especially in the areas of Hanoi and Haiphong, and in the immediate vicinity of the Chinese border, could trigger direct intervention in Vietnam by the Soviet Union or the PRC. He was very reluctant to approve any bombing in these areas, and to the extent he approved it, he kept the tightest personal control of it. His often-quoted statement “They can’t bomb an outhouse without my permission” describes his attitude toward the use of air power in the northern half of North Vietnam. In April 1968, Johnson halted all bombing of the northern part of North Vietnam. It did not resume on any significant scale until 1972, and even if one includes the bombing of 1972, Hanoi was never subjected to anything like the pounding that had been applied to every North Korean city during the Korean War, and to almost every German and Japanese city during World War II. Looking at the northern part of North Vietnam, one sees a restricted use of air power. Those who believed in tactical bombing, and those who thought that the war was essentially a struggle against the guerrillas in South Vietnam, looked at areas closer to the battlefields in the South, and saw a very different picture. An enormous weight of U.S. bombing was applied in South Vietnam, and in the areas of Laos through which the Ho Chi Minh Trail carried supplies and reinforcements from North Vietnam to Communist forces in the South. South Vietnam became by a wide margin the most heavily bombed country in the history of the world, and Laos became the second most heavily bombed. The White House, furthermore, left the details—the choices of which targets were to be hit in South Vietnam and along the Ho Chi Minh Trail, and when—pretty much to the military. The southern part of North Vietnam, especially the area within about 200 kilometers of the DMZ, was intermediate in terms of U.S. policy. Lyndon Johnson approved missions in this area much more readily than he did in the areas further north, and he did not control the missions in such detail. He often approved missions of “armed reconnaissance” in which pilots were authorized to search an area, often quite a large area, and bomb whatever targets of opportunity they found there. The towns of this area were devastated in a fashion that never happened to Hanoi. Bombing was not halted there until October 1968, and the halt was not as absolute as in the area farther north; a significant number of strikes were flown between 1969 and 1971. Air power was used in the Second Indochina War on a far larger scale than in any other war in history, and it shaped the conduct of ground operations to a far greater extent than in any previous war. By 1968, the three busiest airports in the world were all in Vietnam: Bien Hoa, Danang, and Tan Son Nhut in that order. United States bombers and fighter-bombers expended more than 6,715,500 tons of air munitions in Indochina during this war. More than 3,203,000 tons of this were expended in South Vietnam from 1962 to 1973, and 2,093,300 tons in Laos from 1964 to 1973, making these the two most heavily bombed countries in the history of the world. Some 880,108 tons were expended in North Vietnam from 1964 to 1973, and 539,129 tons in Cambodia from 1969 to 1973. A majority of the munitions tonnage fell on South Vietnam in each year from 1962 to 1969, and in 1972; on Laos in 1970 and 1971; and on Cambodia in 1973. There was no year when a majority fell on North Vietnam. Aside from bombers and fighter-bombers, there were also helicopters, fixed-wing gunships, the C-130 transport planes that dropped more than 3,700 tons of the huge M-121 and BLU-82 bombs, and other aircraft. U.S. and allied aircraft of all types expended a total of about 8,000,000 tons of air munitions of all types, with about half falling on South Vietnam. This enormous application of aerial firepower not only inflicted heavy casualties on Communist forces, but allowed relatively small U.S. and allied ground units to operate in areas where they could not otherwise have been sent. If they were attacked by forces far too strong for their own weapons to have given them any chance of survival, they could often (not always, but often) be saved by air support. The United States modified the physical environment of the war by spraying herbicides from aircraft to kill trees and brush. Efforts to modify the weather and the structure of the soil were less successful. U.S. Air Force (USAF) fixed-wing transport planes were carrying 2,732 tons of cargo per day in Vietnam during the peak year, 1968. The peak year for cargo transport by helicopters, which could reach smaller units in the field, was 1969, with an average of 3,533 tons per day. Many positions in isolated locations could not have survived without air supply. Airmobility—helicopter transport of troops—radically altered the nature of warfare. An airmobile unit could be landed in the middle of enemy territory in an organized fashion, not scattered by having the men come down individually by parachute. When men were wounded, medical evacuation helicopters carried them to hospitals. Thousands of men suffered wounds that in any previous war would have been fatal, but survived because of the speed with which helicopters brought them to hospitals. Medical evacuation by helicopter also allowed units that had suffered casualties to retain their mobility; they did not need to carry their wounded because the wounded had been sent off into the sky. If enemy forces in an area were too strong, a whole unit could sometimes be picked up and carried to safety. The American air war in South Vietnam began late in 1961 when USAF pilots were sent to Vietnam under Project Farm Gate. Army helicopter pilots joined them at the end of the year, and a Marine Corps helicopter unit early in 1962. Their operations were at first kept quiet; the United States maintained a pretense that U.S. military personnel were in Vietnam only as advisers, not to conduct combat operations themselves. The first overt USAF combat missions in South Vietnam were flown on February 19, 1965, by B-57 Canberra bombers based at Bien Hoa. The U.S. bombing campaign against North Vietnam started with sporadic air strikes—the U.S. retaliation for the Tonkin Gulf incidents in August 1964, and Operation Flaming Dart in February 1965. These were followed by a systematic bombing campaign, Rolling Thunder, from March 1965 to October 1968. There were only occasional strikes from then until 1972. Systematic bombing resumed in Operations Freedom Train in April 1972, and Linebacker beginning in May. Linebacker II, the famous “Christmas Bombing,” came in the second half of December. All U.S. bombing of North Vietnam was halted in January 1973. Characterizations of the U.S. air war as limited, and complaints about presidential interference in the choice of targets, refer primarily to North Vietnam, especially the northern half of North Vietnam. Lyndon Johnson was very worried about possible reactions by China or the Soviet Union to U.S. bombing of the northern half of North Vietnam, and he exercised tight personal control over bombing missions there. He allowed the military considerably more freedom in the bombing of the southern panhandle of North Vietnam, where all the major towns suffered devastation of a sort never inflicted on Hanoi. He allowed great freedom in the bombing of South Vietnam and Laos. 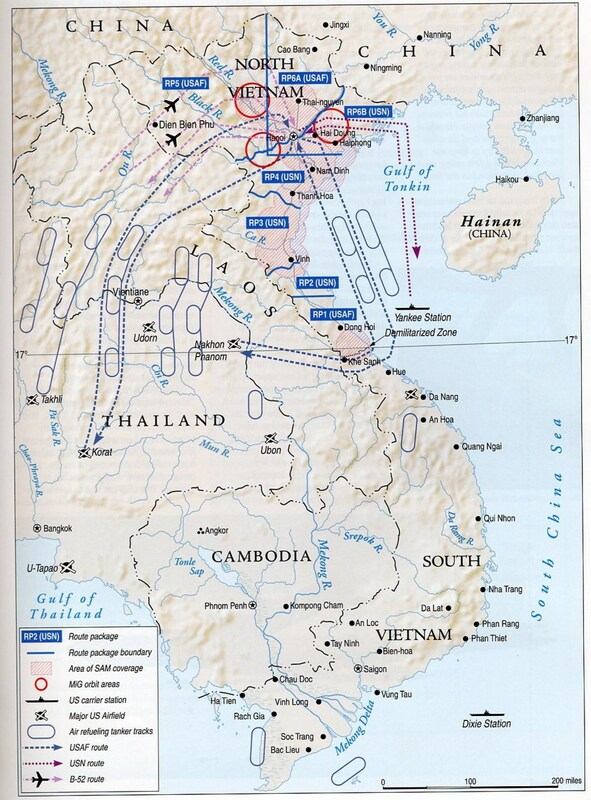 Air-to-air combat occurred mainly over North Vietnam, though there were a few incidents over Laos. The American planes tended to be larger and heavier, with more sophisticated equipment, but with a relatively low ratio of wing area to weight, which limited their maneuverability. The North Vietnamese MiGs were smaller, lighter, and more maneuverable. The Americans enjoyed a favorable kill ratio. 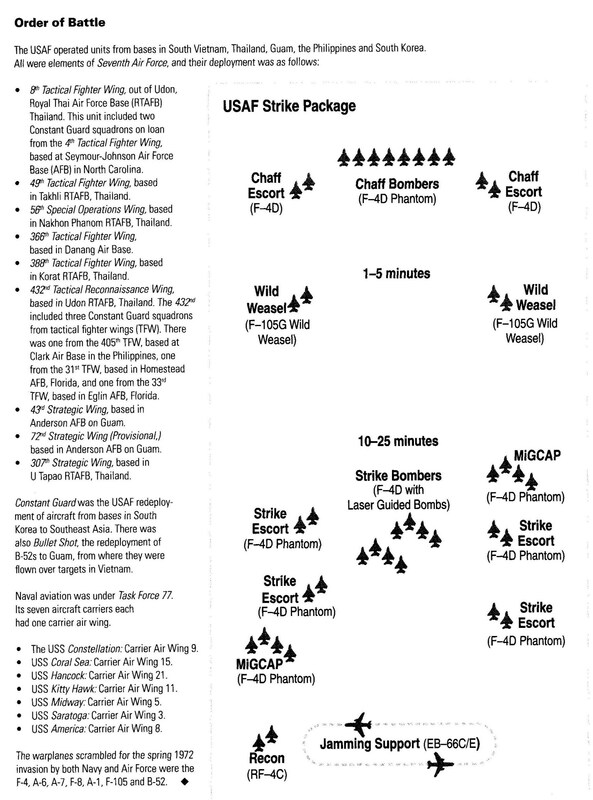 The airfields from which the MiGs flew were off limits to U.S. bombing until April 1967. Two airfields were bombed on April 24, 1967; raids were authorized against the others gradually over the coming months, and the last, Phuc Yen, was finally bombed on October 25. By late fall of 1967, most of the MiGs had shifted to bases in China. U.S. aircraft also faced strong ground-based air defenses in North Vietnam. There were a few U.S. air strikes on Laos in 1964; bombing became systematic and massive in 1965, and remained so until February 22, 1973. The last isolated air strikes were in April 1973. Bombing in Laos fell mainly on the Ho Chi Minh Trail in the South, but there was also bombing in northern Laos, supporting the Royal Laotian Army and the Central Intelligence Agency’s “Secret Army” of Hmong tribesmen in their war against PAVN and Pathet Lao forces. The CIA’s proprietary airline Air America provided vital support for the Secret Army. Respecting the fiction of Laotian neutrality, the United States for years avoided openly acknowledging its air war in Laos, but the bombing was not in any genuine sense secret. When significant U.S. bombing of Cambodia began in March 1969 under Operation Menu, it was truly secret. The administration of Richard Nixon was determined to prevent the press, the Congress, or even most U.S. military officers from learning that it was occurring. Overt bombing of Cambodia did not begin until April 1970. It remained on a limited scale until U.S. bombing of South Vietnam and North Vietnam was halted completely, and bombing of Laos halted almost completely, in January and February 1973. With only Cambodia left to bomb, the United States intensified the bombing there to far higher levels than had ever been attained before. The U.S. Congress finally forced a halt to the bombing on August 15, 1973. The most common type of bomb used in Vietnam was the general purpose (GP) high-explosive bomb. About half the weight of such a bomb was actual explosive, and half the weight was the steel case. The 500-pound MK-82 bomb (see photograph 15), for example, contained 192 pounds of explosive; the 750-pound M-117 contained 386 pounds of explosive; the 2,000-pound MK-84 contained 946 pounds of explosive. The most common bomb size in the Vietnam War was 750 pounds, and the 500-pound bomb was the second most common, but 125-pound, 250-pound, 1,000-pound, 2,000-pound, and 3000-pound bombs were also used in significant numbers. “Snake-eye” bombs had large tail flaps that unfolded after the aircraft released them, to slow their fall. These could be dropped from low altitude; slowing the fall of the bomb gave the plane that dropped it time to get far enough away not to be damaged by the explosion. “Daisy cutter” bombs used a fuze extender, a long rod attached to the nose of a bomb. When the tip of the fuze extender struck the ground, the bomb would detonate. Detonation while the body of the bomb was still above ground level produced less of a crater, but made the bomb very effective for knocking down trees. Small “daisy cutter” bombs, 500 pounds, were sometimes dropped near roads that the Communist forces were using, to cause trees to fall across the roads and block them. Very large ones, dropped under the code name Commando Vault from C-130 transport aircraft, were used either for the destruction of military targets or for the creation of instant helicopter landing zones in the jungle. The first test drops, using five-ton M-121 bombs, were performed in South Vietnam in October 1968. Each M-121 cleared an area about 200 feet in diameter. More than 200 were eventually dropped. Commando Vault began using an even larger bomb, the 15,000-pound BLU-82, which could create a clearing about 260 feet in diameter, in March 1970. More than 360 BLU-82 bombs had been dropped, in South Vietnam, Laos, and Cambodia, by the time U.S. bombing was ended in 1973. The Vietnamese Air Force (VNAF) dropped an additional 15 of them during the last weeks of the war, in April 1975. Fuel-air explosive bombs were also used occasionally in Vietnam. These were designed to release a cloud of flammable gas, which was detonated only after it had had time to mix with the air. A smart bomb is one that is actively guided to its target after leaving the aircraft, rather than simply falling under the influence of gravity. The concept had been tested occasionally in combat beginning late in World War II, but the technology matured to the point of making this a truly effective weapon during the Vietnam War. The AGM-62 Walleye had a television camera in its nose; once it had locked onto the target, it steered itself. It was a glide bomb with a slant range of up to 40,000 feet. Its main disadvantage was that its camera needed daylight, good visibility, and a high-contrast target. Its shaped-charge warhead was effective against pinpoint targets, but was not very large; American pilots were frustrated when direct hits by Walleyes failed to knock down the very strongly built Ham Rong Bridge, in Thanh Hoa province. It began combat tests in March 1967, and came into full operational use early in 1968. Laser guidance proved a more versatile means of steering smart bombs to their targets. Usually, one aircraft would shine a laser on the target, while another dropped the bomb, usually an MK-84 2,000-pound bomb with a seeker head and steering fins added to allow it to guide itself to the bright spot. The bomb had far more explosive power than the Walleye, and could be used at night and against targets that were not visually conspicuous enough for the television camera in the Walleye to lock onto them. Combat tests began in 1968, but little is known about the early tests and they may not have been very successful. The first combat test of a very successful design was on February 3, 1971, when an F-4 Phantom destroyed a 37-mm anti-aircraft gun in Laos, using a bomb equipped with a Pave Sword laser-seeker pod. A laser target designator aboard an AC-130 gunship provided the bright spot on the target. Smaller OV-10 aircraft were soon also being equipped with laser target designators. The bomb proved itself during the following months in Laos; in 1972 it was used with spectacular success against considerably more important targets in North Vietnam, during Operation Linebacker. Capital of the Democratic Republic of Vietnam (DRV), located in the Red River Delta, about 95 kilometers from the sea. Under the name Thang Long, the city had been the traditional capital of Vietnam up to the late 18th century. 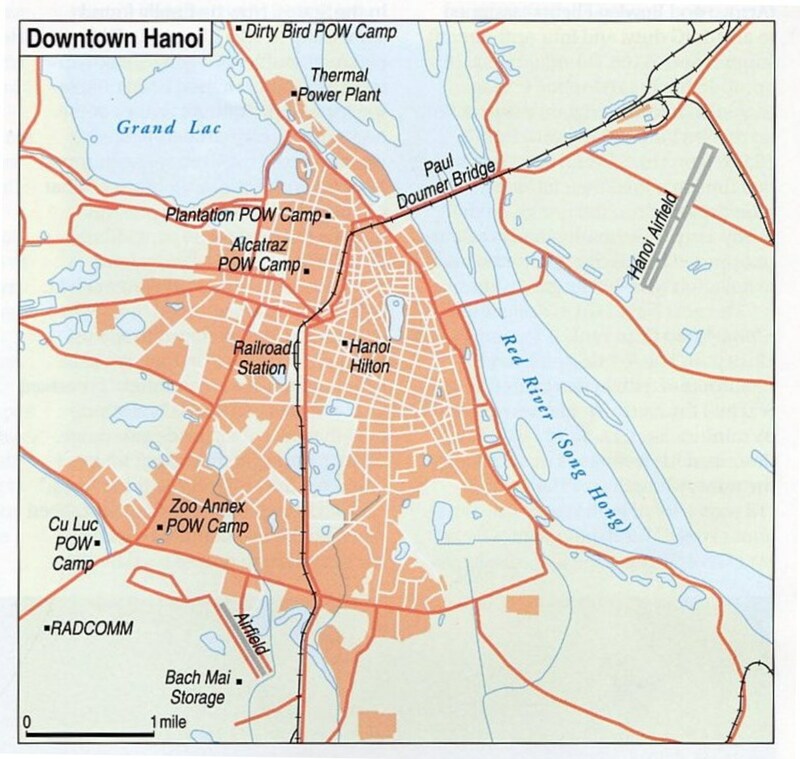 Hanoi was not a major industrial center; its importance during the Second Indochina War was as a transportation nexus (both road and rail traffic crossed the Red River by the Doumer Bridge in Hanoi), an administrative center, and a symbol. The question of bombing Hanoi was a contentious one through much of the war. The U.S. Air Force, dominated by doctrines of strategic bombing, urged attacks on targets in Hanoi. President Lyndon Johnson was very reluctant; he feared the possible reactions of China, the Soviet Union, and public opinion in the West, and he may have felt (some of his advisers are known to have felt) that once targets were destroyed, the United States would no longer be able to threaten to destroy them. President Johnson initially defined a restricted zone, a circular area with a radius of 30 nautical miles (55.56 kilometers) measured from the center of the city, in which air strikes could be flown only with his specific permission. The degree of his willingness to grant such permission fluctuated. Sometimes there was a smaller circle within the large one, inside which air strikes were completely prohibited. The first air strikes within five nautical miles of the city center were in June and August 1966. The next strikes in this area, in the first half of December, were considerably heavier. The DRV, wishing to publicize this intensification of the bombing, invited Harrison Salisbury of The New York Times to come to Vietnam late in December. Salisbury’s reports from Hanoi caused considerable controversy. The restrictions on bombing were further loosened in 1967. In May and June there were numerous raids on the edges of Hanoi, and a few against targets such as the electric power plant and the waterworks, well inside the city. Beginning in August there were occasional attacks on the Doumer Bridge, very close to the city center. U.S. bombing of the Hanoi area was terminated in April 1968, and did not resume until April 1972. Even then it was on a much more limited scale than most people realize. Operation Linebacker II, the so-called “Christmas bombing” of December 1972, hit many targets on the edges of Hanoi but did little damage to the city center. By the middle and late stages of the Vietnam War, North Vietnam had what is often described as the strongest air defense system in history, though it is important to remember that this is true only in an absolute and not in a relative sense. North Vietnam’s air defenses were stronger in 1967 than Germany’s had been in 1943, but the attacking aircraft had improved during the intervening years by an even greater margin; North Vietnamese defenses posed less danger to the jet aircraft that were attacking North Vietnam in 1967 than Germany’s had to the much slower aircraft attacking Germany in 1943. 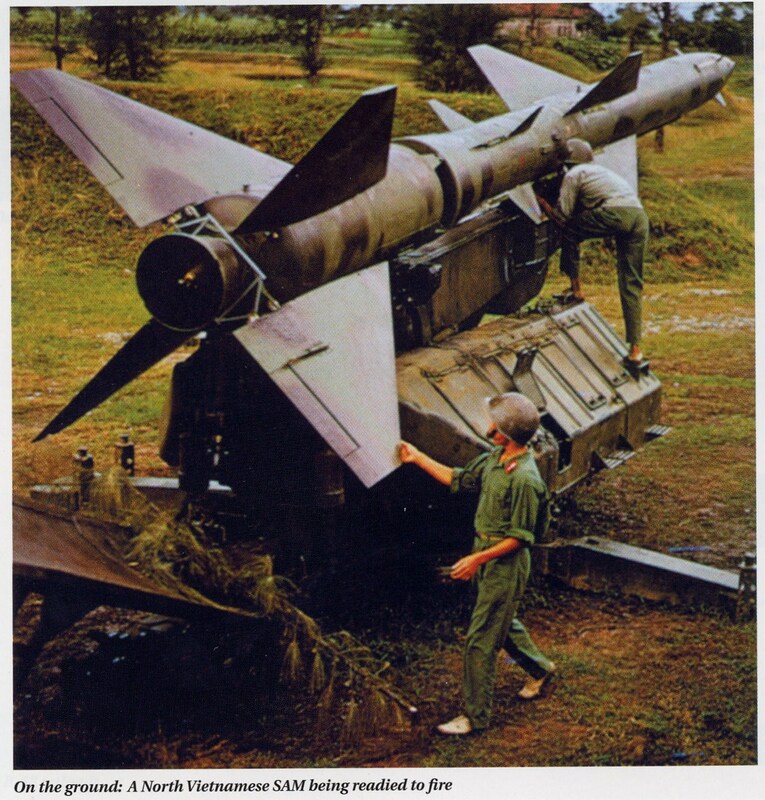 The most important component of the North Vietnamese air defenses was anti-aircraft artillery. The 100-mm radar-aimed guns, from the Soviet Union, could reach altitudes of 30,000 feet and could pose serious dangers to aircraft at altitudes as high as 20,000 or 25,000 feet. The 57-mm guns might be either radar-guided or visually aimed. Smaller visually aimed cannon, 23-mm and 37-mm, could be very dangerous to planes at lower altitudes. The 12.7-mm and 14.5-mm machine guns and the rifles of peasant militiamen knocked down few U.S. planes, but were nonetheless significant in deterring U.S. planes from using very low altitudes to dodge the fire of the larger guns. A rocket designed to be fired from the ground against aircraft. Early in 1965, the Soviet Union began to supply the Dvina missile to the DRV. This was a relatively large two-stage rocket, with a solid-fuel booster and a liquid-fuel final stage. Approximate specifications (subject to some variation between models): length 10.7 meters, warhead 130 kilograms, range 40 to 50 kilometers, ceiling 18,000 meters. It was referred to in American sources usually as the SA-2 or SAM-2, sometimes as the Guideline. The Dvina did not itself track its target; instead a radar on the ground, of the type the United States called Fan Song, tracked both the rocket and the target aircraft, and furnished data to a control unit also on the ground, which steered the rocket by radio. The percentage of hits achieved by Dvina rockets was relatively low; a pilot who saw the rocket coming could usually dodge it successfully, and pilots usually had some warning that missiles were in the air—they saw the conspicuous takeoff of the missile, they got warning from detection devices in their aircraft that the Fan Song was tracking them, or they got warnings by radio from other pilots. The Americans also sometimes could jam either the Fan Song radar or the radio signals that steered the missile to the target. The first success by a Dvina over North Vietnam was the downing of an F-4C Phantom on July 24, 1965. The U.S. military, which had been asking President Lyndon Johnson for permission to bomb the SAM launching sites, construction of which had been observed by U.S. reconnaissance, got that permission after this incident. The first air strikes against SAM launch sites were flown on July 27. American aircraft assigned to attack the launch sites and guidance radars later came to be called Iron Hand and Wild Weasel. The Dvina was designed to hit aircraft at relatively high altitudes. American aircraft in areas where there were SAMs usually stayed at lower altitudes, to be less vulnerable to the missiles, but this made them more vulnerable to fire from anti-aircraft artillery. When SAMs were fired, dodging them involved diving still lower. B-52 high-altitude bombers usually stayed away from the sections of North Vietnam defended by missiles; not until November 1972 was a B-52 shot down by a SAM. In 1967, some Dvinas began to be guided optically, rather than by the Fan Song radar, depriving the American pilots of the warning they had been getting when a Fan Song locked onto a plane. The fact that the Dvina was the only important SAM threat to aircraft over North Vietnam allowed American pilots to use standardized procedures for avoiding SAMs. The Soviet Union could have made the air defenses of the DRV more effective by providing a greater variety of SAMs, such that a single avoidance technique would not be appropriate for all, but this did not happen for a long time if at all. According to some sources, the S-125 Neva, also called the SA-3 or Goa, effective at lower altitudes than the Dvina, finally entered service in North Vietnam in late 1972. A few Dvinas began to be used in Laos, to defend the Ho Chi Minh Trail against air attack, in March 1971. They became a serious threat, forcing the United States to restrict the operations of fixed-wing gunships in crucial areas of Laos, in 1972. Dvinas were first fired at aircraft over the northernmost portion of South Vietnam, some from launch sites in North Vietnam or in the Demilitarized Zone, some apparently from sites inside South Vietnam, during the Easter Offensive in 1972. The Strela, which the U.S. called the SA-7 or Grail, was a shoulder-launched missile that steered itself to the target, using an infrared sensor to home in on the engine heat of an aircraft. Its very short range—3,500 meters—did not allow much effectiveness against jet aircraft, since the missile would normally have to overtake the target from the rear, and it could not often overtake a jet before running out of fuel. The Strela was much more effective against helicopters. Its greatest effect on fixed-wing air operations was that it forced the relatively slow aircraft used by most Forward Air Controllers (FACs) to shift to higher altitudes for safety, which greatly reduced the FACs’ ability to spot targets on the ground. Its first impact on the war was in Laos during Lam Son 719, the ARVN effort to cut the Ho Chi Minh Trail in 1971. The Strela did not appear in South Vietnam until the Easter Offensive of 1972; the first downing of a helicopter by a Strela in South Vietnam occurred on May 2, 1972, and the first downing of a jet occurred on May 26. A modified version with a somewhat greater range was introduced toward the end of the war. The United States deployed a few Hawk surface-to-air missiles to South Vietnam beginning in late 1964, in case the North Vietnamese attempted air attacks against U.S. bases in South Vietnam. Two Hawk missile battalions were sent in September 1965. The missiles were never used; they were withdrawn in 1968 and 1969. The Paris negotiations seemed close to success in October 1972, and U.S. bombing of the northern part of North Vietnam was halted. But the negotiations stalled amid mutual recriminations in December; there is a widespread though false story that the Democratic Republic of Vietnam (DRV) had even walked out of the peace talks. The DRV began evacuating the civilian population of Hanoi in anticipation of possible heavy bombing. President Richard Nixon indeed ordered a major bombing campaign, Linebacker II, which ran from December 18 to 24, stopped for one day on Christmas, and then resumed from December 26 to 29. During the 11 days of bombing, B-52s dropped 15,237 tons of bombs on North Vietnam, almost all north of the 20th parallel and mostly in the area of Hanoi. Fighter-bombers dropped about 5,000 tons. These tonnages exceeded the usual levels of U.S. bombing, but not by a huge margin. The reason the damage done was far greater than usual was that Linebacker II went for much more important targets than U.S. bombing of North Vietnam usually had done. The fear of aircraft losses that had previously kept B-52s out of the areas of heaviest air defenses was completely discarded, and the fears of international repercussions that had inhibited bombing in the Hanoi and Haiphong areas were largely discarded. The U.S. military said 15 B-52s had been lost and nine damaged, and denied rumors that some of the damaged ones were beyond repair. The number of smaller airplanes lost was variously given as 11 or 13. Linebacker II inspired a worldwide storm of outrage, based on a serious misunderstanding of its nature. Most people got the impression that it was an extraordinarily ruthless campaign, pounding cities in the style of World War II. All of America’s major allies were bitterly critical. The U.S. government made little effort to explain that while the Hanoi area was being heavily bombed, almost all the bombs were directed at military targets on the outskirts; the city center was little damaged. The Vietnamese have released a variety of figures on the casualties. Preliminary data released immediately after the bombing, before there had been time to do a thorough search for bodies under the rubble, indicated that 1,318 civilians had been killed in Hanoi and 305 in Haiphong. Later figures, indicating that either 2,027 or 2,196 people had been killed in Hanoi, included civilian bodies discovered after the preliminary figures were released, but they may also have included military casualties. A figure of 2,368 dead for North Vietnam as a whole was probably a final total for civilian dead only. Linebacker II left both sides eager for a settlement. Nixon needed peace to counter the widespread belief that he had engaged in a mass slaughter of civilians, and the DRV needed an opportunity to rebuild transport systems, power plants, and many military facilities. The Paris Peace Agreement was signed on January 27, 1973; it was similar in most ways to the agreement that had almost been signed in October 1972.